We tried the size Medium in this jacket on Huey and we put an XL jacket on Dewey. Both jackets fit, but there wasn’t a lot of room for error in both the waist and chest. This style has a bit more of a trim fit than most Icon jackets. We generally advise people to buy the size they normally wear in men’s clothing, and I’d stick with that advice on this style as well IF you like a trim fit and you have an average or thinner frame. If you like more room and/or you have a more stout build, then I’d advise you to go up one size. Below is the size chart offered by Icon and in the case of this style, I’d say it is just about right. If you measure and use the chart you may well find yourself buying one size larger than usual. The Overlord SB2 is a non-vented version of the otherwise very similar Overlord Primary jacket. This jacket is a good all-around vented textile motorcycle jacket with sharp styling and very good armor protection. The shell of this jacket is largely textile, but it does some perforations up on the shoulders and the material used in the underarms will flow air as well. I also see “two way” zippers at the sleeve ends, so you can zip those down toward the cuff from the top and they become sleeve vents. With all the venting and the overall light weight nature of this jacket, I think it will work for all but the hottest temps. And for cooler weather, this jacket does have a removable vest-type liner which you can put in to help block the air flow on the torso and provide just a bit of insulation. The vest will make this jacket work down into “cool” weather. So overall, I’d say this style will be a good one for three seasons… spring, summer and fall. You get a complete set of armor inserts by D3O which is Icon’s “go to” brand of armor. The armor is ideal for a jacket like this since it is soft and flexible and comfortable. So there will be nothing else to buy to make this jacket fully protective. Icon says: Finally, a jacket design as fast as you are. The Overlord SB2 features a durable textile chassis tailored with an aggressive attack fit. Pre-curved arms house D3O® impact protectors, which also include a full D3O® back impact protector. 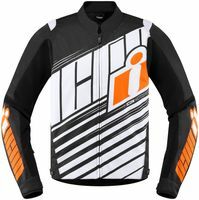 Additional rider-centric details include dual zipper vent cuffs, engineered perforations for enhanced airflow, and a removable quilted liner should the temperature dictate.